Orientation: 9 feet from east side of house. 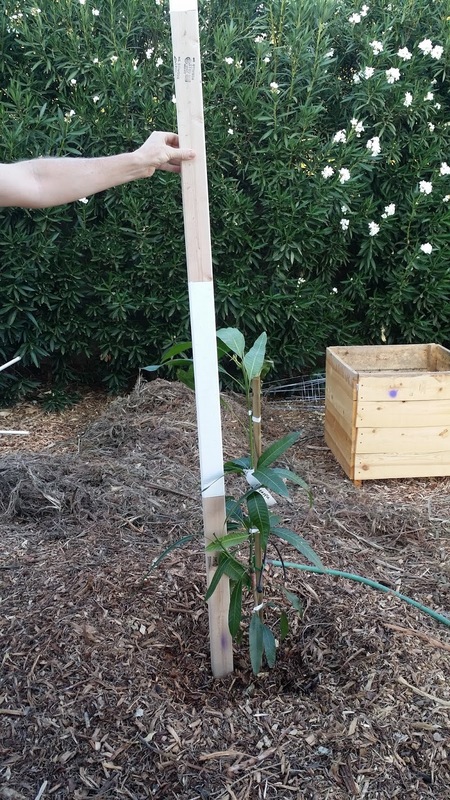 Trunk diameter: 0.5 inches above and below graft. Water: Drip irrigation around 8am daily during summer months. Soil: Native soil, no amendments. Original soil around root ball kept intact when planted. Mulch: Thin layer of wood chips around base of tree with a deeper cone of chips surrounding that. 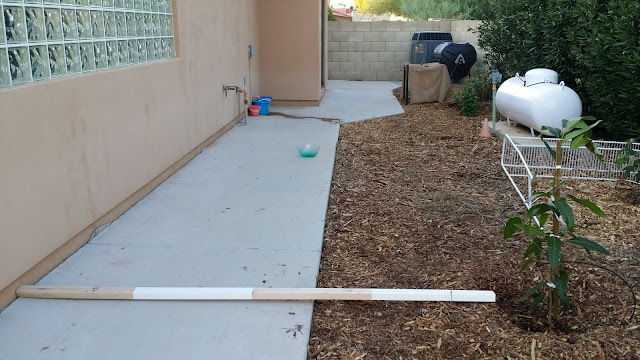 Measure stick: The measure stick shown in the photo is 8 feet long with 2 foot striped markers. Added 60% shade cloth to provide some protection against the sun and heat we're currently experiencing. Swapped out the regular water emitter for a 1/4" soaker ring around the base of the tree. Diameter of the soaker ring is fairly small (around 10") and only a few inches wider than the original root ball. The soaker ring lies on top of the ground and is then covered with around a foot of mulch. In doing so I saw that the mulch around the base of the trees was already starting to turn a healthy black. Looks like there's new growth at the top of the mango. Grabbing this image to see how it changes over time. 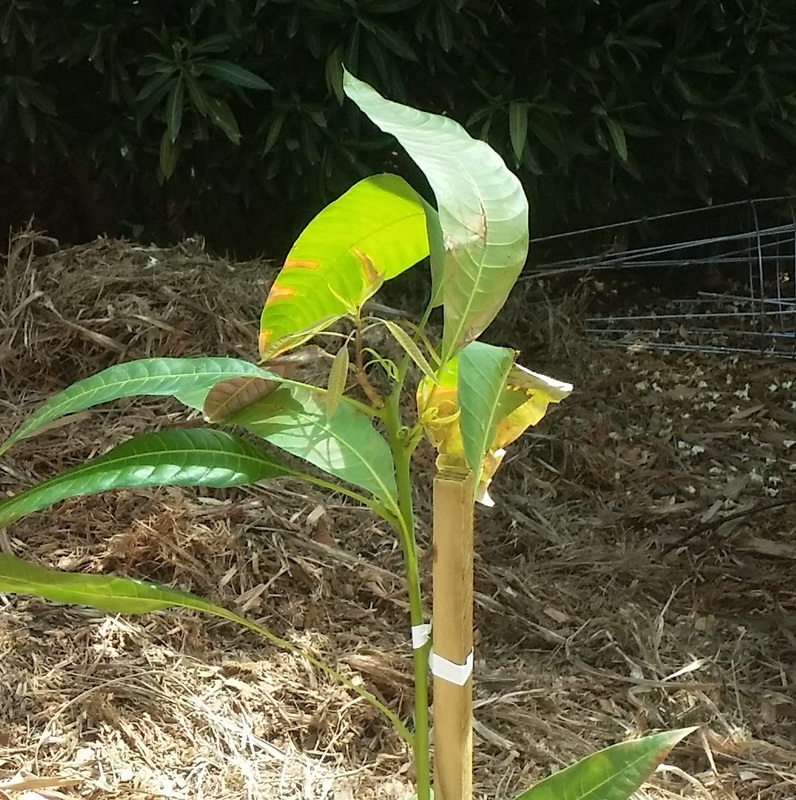 3 New shoots can now be seen on the mango. Two at the top as per the previous logs photo and a new one lower down. Sprinkled 4 handfuls of used (Starbucks) coffee grounds around the based of the tree. 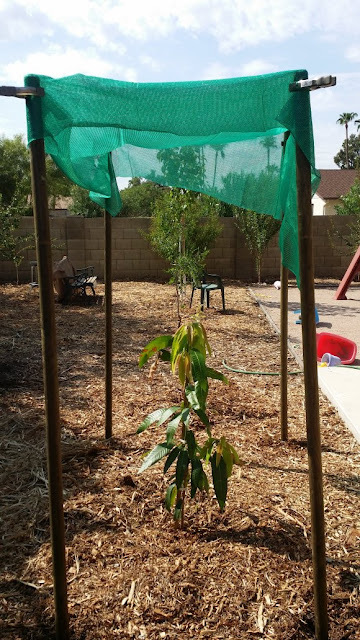 Switched out the flimsy/flexible plastic/rebar poles for 8' wood stakes and extended the shade cloth another foot south.